Come with me. We’re going to the pinnacle of Mount Burger (fictional place that exists only in my head where every burger is perfectly done and you can have them for three meals a day without feeling any ill health effects). Don’t be afraid, take my hand. C’mon, it’s on Wrightwood (1335 West), just east of Southport. It’s not far, don’t worry. It’s called Tavish, and ’tis a special place, where you’ll find the best burger in Chicago by a mile, based on my experience. This thing is huge. I want to say 10 ounces, cooked! It’s hand-formed, and the guy that waited on us (I think it was the chef) says he doesn’t know how much it weighs. He did confide that when it’s done, it’s easily over a half pound. I agree. The size really optimizes the burger-to-bun ratio. Look at that, we are talking a burger-to-bun ratio of around one to one. You just don’t see that very often, which is sad. I’m sold on it now. To think that I used to prefer a 1/3 pounder…what was I thinking? The hand-formed aspect is also very important. It gives it that randomness that I find so desirable. There are gaps and varying thicknesses all over the place. I get it with grilled onions and American cheese. The gaps and voids pull in the melted cheese and juice from the grilled onions. Each bite brings a different sensation of cheese, grilled onions, meat, and bun. Every burger gets its own love and no experience ever repeats itself. 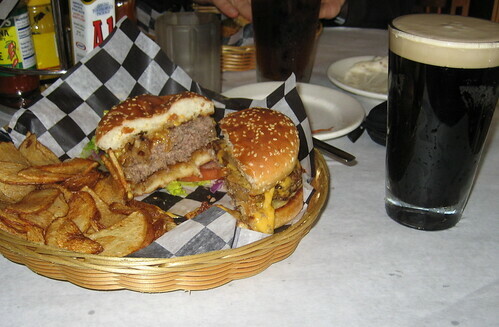 Finally, I think I heard the chef say he combines multiple meats in this burger (ahh, the triumvirate). There has to be some combo of ground sirloin, ground round, and ground chuck, but I don’t have a clue to the ratio. It’s lean, but not as dry and crumbly as you average ground sirloin burger, and it has all the flavor and moistness of a ground beef burger. With this one, I was just chomping along, loving it of course. And then I got one bite that had this special burst of charred meat flavor. I think a hunk of the ground sirloin was packed together on one of the edges and it pulled away from the rest of the burger in one piece. It was a special flavor burst that made the experience especially enjoyable. If somebody says “my favorite burger is” somewhere other than Tavish. You need to ask, “ever been to Tavish?” If they say no; you say bullsh%&! It’s that simple. You know I love Hackney’s. I also love Blackies, Poag Mahone’s, and Green Door Tavern. I’ve had them all multiple times and they are giants on Mount Burger, but they will never reach the heights of Tavish. Poag Mahone’s brags about their 9 ounce burger (I bet they mean pre-cooked), but the Tavish burger is one or two weight classes up, so it wouldn’t even be a fair fight if they decided to throw down. However, I’m willing to leave open that one of the thousand other places I’ve not been is better. There’s still Naha, Erwin, and Rosebud Steakhouse to try. I sincerely hope they are better, I really do. I plan on trying them all and I will keep you posted. Let me just suggest this, go to Tavish before you proclaim your top burger, or you run that risk of looking like an idiot who doesn’t know jack-squat about burgers. Posted in food on 2007/03/26 by John.